What do Hashim Amla and the St George's Park pitch have in common? Both have gone unshaven for a long time. 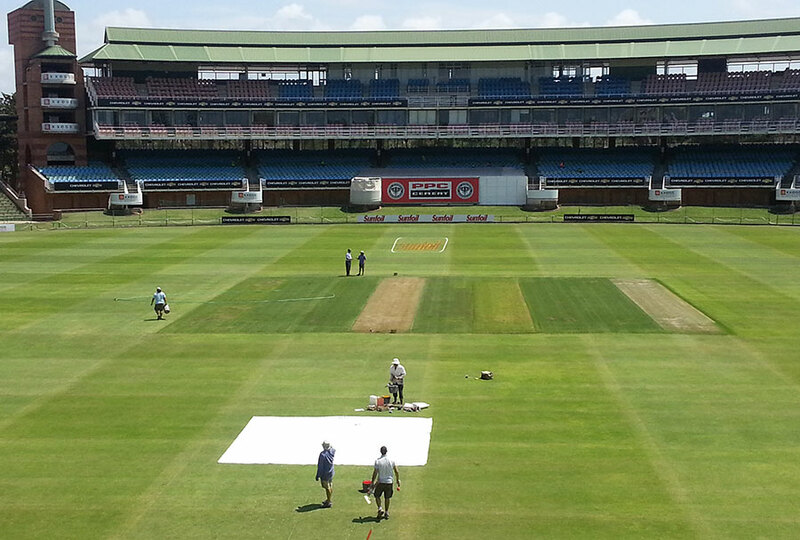 "That pitch scares me at the moment," Adrian Carter, the Port Elizabeth groundsman, told ESPNcricinfo. "I'd like to give it a cut. If it was left like this, I'd be skeptical even for the franchise game because I think there would be a lot of assistance for the seamers." Carter left more than just a healthy covering of grass on his pitch, raising Australian eyebrows, as he awaited instruction from the South African camp, which will likely see a lot of it cut-off. "At the moment, its very furry and it's green," Carter said, before his meeting with Domingo and Co. "I have had a phone call from the South African camp and I'll talk to them again and see what they want. There's a lot of experience in Adrian Birrell and Russell - between them they've coached here for over 10 years - so they know St George's as well as anyone." As soon as the squad arrived at the ground, Domingo, who coached the local franchise - the Warriors - before becoming Gary Kirsten's assistant, and Birrell, who is a former Eastern Province coach, headed straight for the strip. They examined it with Carter, and were joined by bowling coach Allan Donald and Graeme Smith. The conversation appeared good-natured and shortly afterwards, Carter was relaying instructions to his assistants. It's likely South Africa will want some to keep some grass on the surface to assist their own pack, but not so much as to roll out a red carpet for Mitchell Johnson. Morne Morkel, though, said the nature of the pitch should not make a difference to Johnson. "Whether it's a slow wicket or a quick wicket, if a guys is going at 150kph, its quick," Morkel said. "So the pitch won't play a big role in whether a guy like that is effective or not. He is bowling well so it the pace of the wicket doesn't matter." Those words had barely left his mouth when Morkel stressed the pitch will not resemble what he called the quickest Centurion pitch he has seen in 10 years. "It will be completely different from the Highveld," he said. "We know it's a touch slower and there's an almost subcontinent feel." Carter concurred saying even with the grass covering, St George's will never be like SuperSport Park as that simply isn't its character. "I was going through the archives the other day and looking at a report from a Test match here from the early 1900s and they said it was played 'on a slow pitch'. So this pitch has been slow for 114 years. I can't get it quicker," he said. "I don't think St George's will ever behave like Centurion. It's different clay, it's at the coast." Seam movement and swing, rather than bounce, will be an early factor with the wind being an additional element. So far, it has been blowing from a westerly direction, which comes from inland, and is known as the drying wind that flattens the surface out. But is likely to change direction over the course of the next few days, to become more easterly, which comes off the sea, brings clouds, rain and good news for bowlers. That will probably mean the surface won't be allowed to dry out too much and the spin factor may not be as important as it can be here. Carter also said he expects it to hold together for a large part of the match. "We don't get very big cracks. We might get small hairline cracks that open up two millimetres." With that type of surface, Carter said he has been quite pleased with "our four-day pitches over the last few seasons." There have been two four-day games played at St George's Park this summer, both high-scoring. In the Warriors-Cobras clash both teams made over 500 in their first innings and the trend sort-of continued into the Warriors-Titans game. Then, the Warriors made 502 but bowled an under-firing Titans line-up out for under 250. Tellingly, Wayne Parnell took eight wickets in the game and Simon Harmer, the offspinner, finished with six. Considering it will be a similar pitch this time, that may influence South Africa's selection and see Parnell make a Test return on his homeground. And by then, the pitch should only have as much stubble as he does.